Here is a view of the paths before weed cloth. 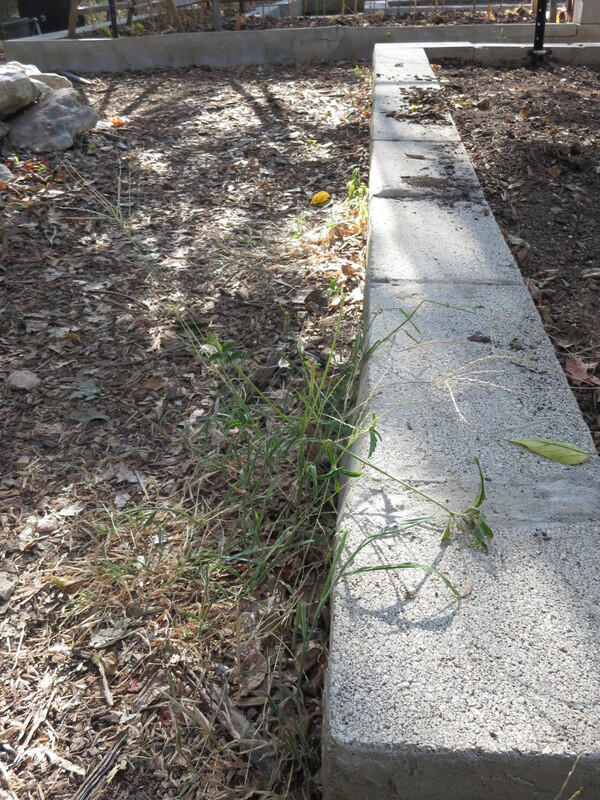 The weeds are not particularly bad in this area, but you can see that it is a constant struggle to keep the grass down and out of the growing beds. 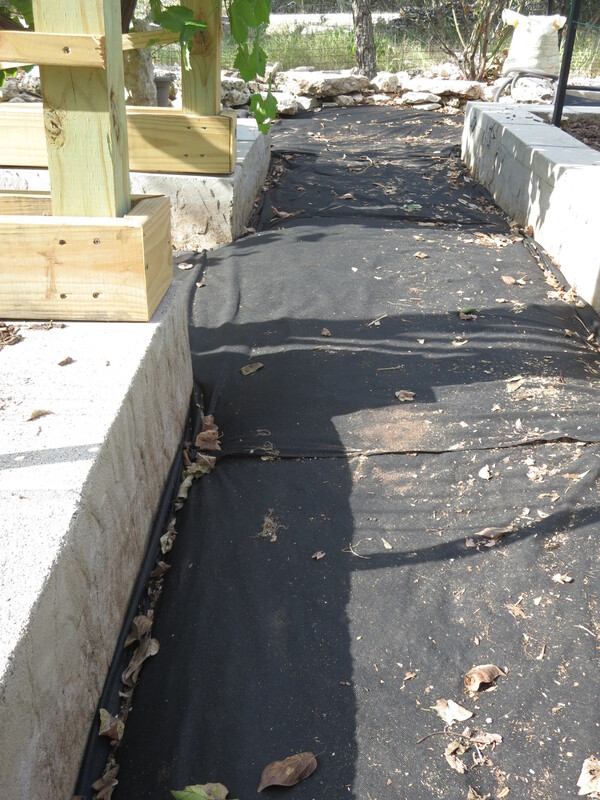 This week we have been very busy in the installation of weed cloth on our garden paths. We have been working with earth covered in wood mulch on the paths for the last several years, but have always battled with weeds, especially grasses, growing in the pathways. This is not very attractive, can be very bothersome (especially if the weeds or grass grow spiky burrs) and can harbor pests from grasshoppers to nematodes. For all of these reasons, we are converting the paths to dirt, covered with weed cloth, and then mulched with fresh wood mulch. Our expectation is that this will bring the battle with the weeds much more in our favor, help us keep pest insects more under control, and add to the beauty of the garden generally. Here is how our paths are looking after the installation. You can see that there is extra layers of cloth at the corner of bed and path. We also overlapped all the intersections so we didn’t leave easy gaps for the grass to get though. The conversion requires that I rake up and carry away all of the mulch in the paths, so I am currently moving it onto the growing beds to increase the depth of the mulch there, I hope it will keep more moisture in the beds as the summer heats up. Then I am breaking up the soil underneath the mulch to remove as much of the weed and grass roots as I can. Since our beds are permanently installed, I am then digging a small trench along the bed where I can overlap and pin down several layers of weed cloth to try to close that gap and not allow any weed up to the light of day. Once I have a smooth and weed free surface, I roll out the length of weed cloth I need and pin it securely to the ground. At every intersection, I am overlapping the weed cloth and working to insure that all of the paths are very nicely covered so we can keep all that unwanted growth under control. Once I finish the project, I will be putting freshly mulched wood chips on the paths, which I hope will keep the whole garden cooler and help it retain moisture, plus give it a nice finished look. 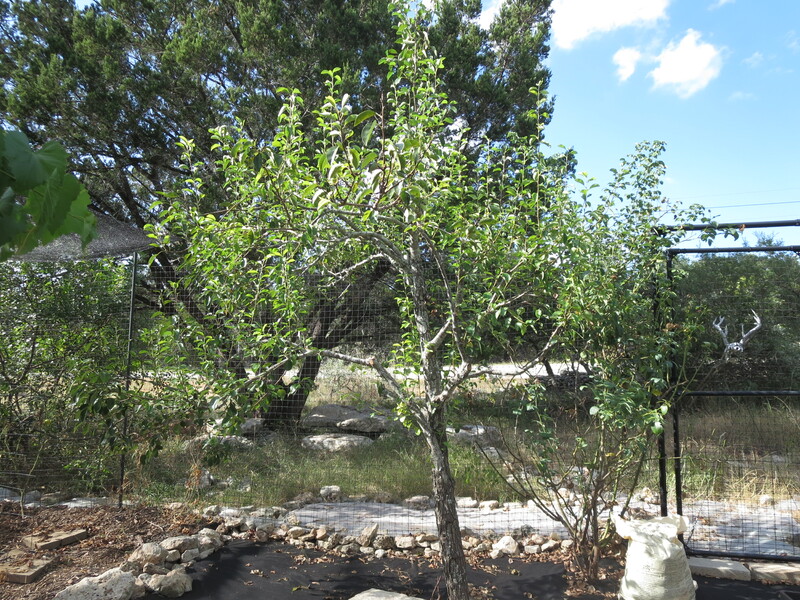 Here is how the pear tree is looking these days. There is lots of new growth, mostly heading straight up, but the tree is still thin and there are occasional outbreaks of blight, although none is visible right now. The pear tree continues to show signs of blight and I continue to hack away at its limbs whenever they show signs of withering. It is painful to keep cutting the tree up, and I hope that this will not go on all summer. The tree has been sending up new shoots from the maimed branches, and where there is no sign of blight, the tree seems to be healthy and strong. I am hopeful that if I can keep the infection in check, the tree will survive and possibly even thrive next year, but we shall see! This week I participated in a fundraiser for Wimberley Flood victims which was organized by the Wimberley Valley Art League. WVAL is an organization of artists who come together to promote art and art appreciation in the community of Wimberley. I serve on the board of directors for the league. The board and membership, under the strong leadership of our president Jan Fitzhugh, organized a donation based one day art sale to raise funds. Artists from Wimberley and across the country donated their work to the sale and all of the funds raised at the event will be donated to Barnabas Connection to aid in the rebuilding of the Wimberley community. 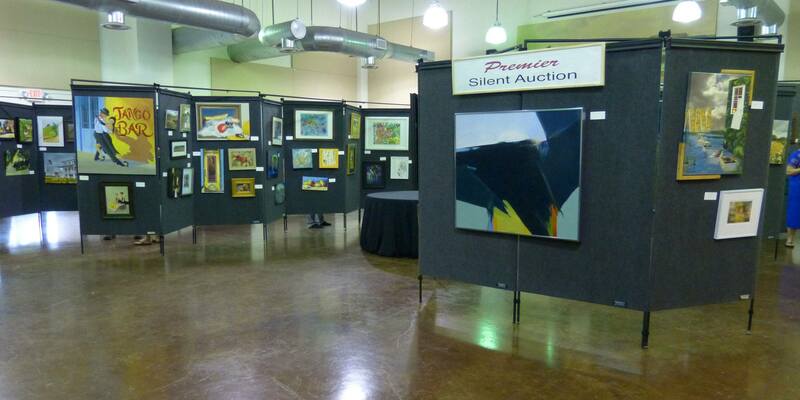 Here is a peek at the gallery before we opened the doors for the sale. There were several silent auctions running, and most every other work of art in the room was being offered at $100. The event was very exciting. We originally imagined having about 100 works of art for sale, but the artists of the community really came out in numbers and we ended up having over 400 works of art donated to the cause. On the day of the sale nearly everything sold, and there were lines of people waiting for us to process the sales for over an hour. It was an amazing turn out and I have never seen so many people so excited to buy art! Many volunteers also worked to make and distribute tasty treats, and beer and wine was available. Musicians from the community donated their time, and played for us, so the whole atmosphere was quite lovely. In the end our humble effort for artists to come together to help Wimberley was a grand success and we raised over $40,000 for the cause. It was an extra-ordinary day.